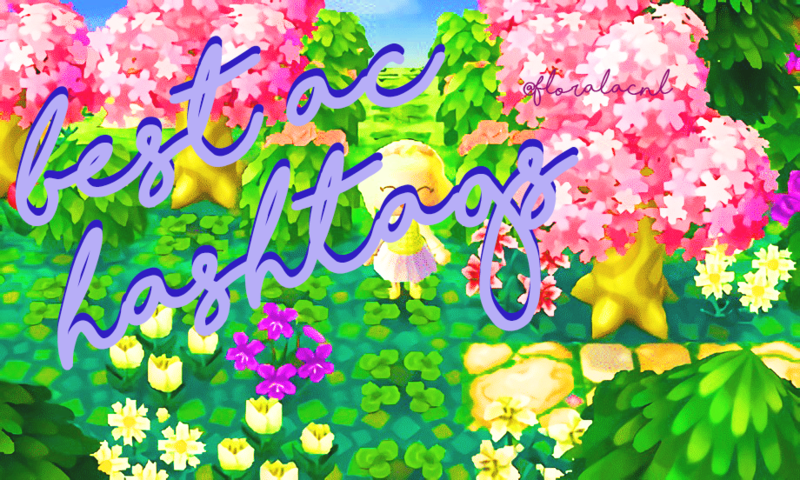 After a discussion with admins over at AC Addicts, it got me thinking...what hashtags are the most used on Instagram? And what ones do I think gain me the best engagement? Now these hashtags are the best ones in relation to Instagram! But I'm sure they crossover onto Tumblr or Twitter too! Instagram Limit; Yes! Instagram has a limit of 30 hashtags per post. I'm guessing this is to stop spam accounts or useless hashtagging. Although it doesn't stop people from using the hashtag "animalcrossing" for their pets. But hey ho! As you can see via the picture above, these are the hashtags I currently use. Over the period of using all these hashtags, I have gained over 200 followers. Is this related to content or my hashtags? Well even with over 5k followers, it's hard to keep engagement. Back in 2015, my posts would go over 100 likes within minutes, whereas now it's a lot slower, noticing a rise in the past couple of weeks. So here's the down low on a few of the popular hashtags, and why you should use them! And if you do use them, how to utilize them! 1. Always make sure your hashtags are in relation to your niche or the specific picture. I remember starting my account and using hashtags that had nothing to do with the pictures I was taking! And I even got told off for it by other instagrammers. Of course, this doesn't mean you can't use similar hashtags, it just makes sure they relate to your whole account! For example; If your main posts are New Leaf, don't go using Pocket Camp hashtags. It can be annoying for those looking for pocket camp pictures. And it works vice versa. It's like if you had a cat, and used a dog hashtag. They're both animals but if you were looking through a dog hashtag and saw a cat, you'd be a little upset right? 2. Keep to a theme in a row. You want your account to look nice and appealing to your followers, so your engagement can go up. Instagram works in having a 3 row system. So if you're going for a theme, make sure the theme is next to eachother. For example; many of us have multiple towns. If you are going to do a theme using multiple towns, use a system that matches and correlates. To some of you, this may seem a bit controlling or having a perfectionist outlook. But if you want to build your instagram portfolio, you need to appeal to your audience. 4. 1st town x6, 2nd town x6, 3rd town x6. 5. 1st town, 2nd town, 1st town, 3rd town, 1st town, 3rd town. 3. Posting times! There are specific times where your content will get the most engagement. And things you can do to help that. The first thing is Instagram stories, utilize them! They're not like posts where they can constantly update every time, they stay at the top, and play straight after one another. Every time you make a new post, screenshot it and add it to your Instagram story! It allows the instagram algorithm to get lost! And followers then know you've at least posted! The next thing is when to actually post. Of course, you may have a variety of different followers in a different timezone. This is why insights is helpful (have a little play with Instagram.) See my photo below! My followers are mostly from the United States or the UK. This is extremely helpful to help utilize when the best time to post is. Most people check Instagram on their lunch break, or after work (4pm-5pm). It's also helpful to look at your demographic (many of my followers are teenagers, so will most likely see around 4pm). Then there's just after your tea/dinner (7/8pm). These are the best times to post. So for me, being the UK I would usually post around 8pm. As that's when I'm sitting down to edit my photos and getting them in the best quality. If we look at that specific time, in the USA that's around 3pm or 10am, which may not be the best time to post (that's why Instagram stories are important!). However, if I am managing to be awake or have an Instagram scheduling app, the best time for me to post would be around 1am/2am. That way I'm either catching those having their lunch, or are just settling for the night scrolling through their phone! Piece of cake. Now, let's get onto the best hashtags. I have found these hashtags to not only be the most used, but the most active people will scroll through and just spam like. All of these are in relation to my pictures. KNOW Cosmetics 4 in 1 Brow; Review and Photos!